CrossKnowledge has been selected by L’Oréal to digitalize the entire process of the famous BrandStorm Challenge. This groundbreaking competition offers a wonderful opportunity for first- and second-year business school students to showcase their skills by presenting an innovative project while helping the company to identify and attract emerging talents. Every year, the entrepreneurial project focuses on one of the Group’s brands. Each team is made up of three students, with their teacher acting as coach. After the national finals, the teams will compete in June 2016 at the international finals in Paris. 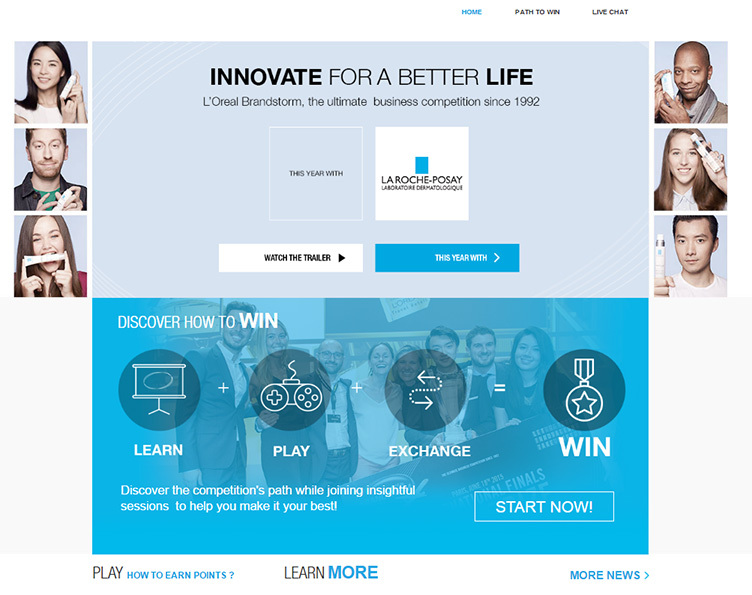 Launched last September, the 2016 edition focuses on the La Roche Posay brand and involves 15,000 students from over 300 schools in 58 countries. CrossKnowledge worked with L’Oréal from the outset on re-engineering and storyboarding a digital learning system that could be applied to the competition. It was necessary to develop an environment for interaction and knowledge-sharing at all the different stages of the competition: team enrollment (without the usually downloadable application forms, for example), helping teams prepare their entries, and presenting the different stages of the competition including the national and international finals. Digitalizing the process has also made it possible to automate e-mail notifications according to key dates and events. The second part of the project involved providing the teams with as much methodological and educational material as possible throughout the competition, in the form of content and learning items developed by L’Oréal and hand chosen from the CrossKnowledge catalog. “Digitalization allows us to support the students in a more innovative and interactive way, as part of a continuous learning process. It fully responds to our aim of offering genuine services to young people, helping them to acquire professional skills and to prepare for their future careers,” says Jean-Claude Le Grand, Director of International Human Resources Development and Corporate Diversity. Once they have enrolled, students log on to the CrossKnowledge platform, which has been entirely customized for Brandstorm. They are then guided through the process step by step. Each section gives them the keys to successfully completing the different stages: how to put their teams together, how to make a successful presentation in front of the jury, how to prepare a business plan, and so on. After the competition, the finalists can publish their national or international finalist certificates on their LinkedIn profiles directly from the CrossKnowledge platform using the “Add to Profile” function. Students can thus highlight their achievements within the community and showcase their skills. “We are very proud to be supporting L’Oréal on such an emblematic project as Brandstorm. Helping students to prepare for the competition, allowing them to hone their professional skills, and enhancing their employability are all consistent with our core aims at CrossKnowledge,” says Michel Thirapounnho, Director of the CrossKnowledge Luxury and Cosmetics Unit.